Life with braces isn’t drastically different than life without them. However, there are a few food items you will need to say a temporary goodbye to eating. Certain foods can do serious damage to your braces and create unnecessary trips to the orthodontist's office to fix broken brackets or loose wires. But don’t panic! The list of foods you can eat heavily outweighs the list you should avoid. The first week with braces can be the most uncomfortable. While your teeth are adjusting to the new hardware in your mouth, your diet will mainly consist of only soft foods for a few days. After the initial adjustment period has passed, you can begin eating “regular” food again--with the exception of a few things. Here are five of the top braces-damaging food culprits that you should take caution towards while you have braces. First off, you’ll need to say “so long” to caramels, taffy, and gummy-anything candies! Soft and chewy candies like these can cause the brackets and wires on your braces to slowly become loose and wobbly, disrupting the dental correction process. If hard candies like jolly ranchers or jawbreakers are your weakness, be ready to cut those out as well. Pieces of hard candies can get lodged in between the brackets and your teeth, and, even worse, they can completely break a bracket. Just look at it as taking a short, healthy break from sugar! Crunchy snacks like popcorn, corn chips, pretzels, hard crusts, and crackers are tasty, but can bring on quite a battle with your braces. Imagine sitting down in a movie theater with a bag of popcorn and suddenly a bracket from one of your braces pops off from the hard kernel you just chomped down on! Not only do you miss out on finishing your bag of popcorn and movie, but now you’ll need to make a trip to the orthodontist. A good alternative for all you popcorn lovers is Pirate's Booty-very similar to popcorn, but without kernels that can embed in gum tissues and unpopped kernels that can debond brackets. This one may go without saying, but we couldn't leave chewing gum off the list. Aside from the issue of it getting stuck in your braces, chewing gum can also bend the wires out of shape. This disrupts and prolongs the dental correction process. Bent wire = no straight teeth. So if you really love the minty fresh breath that gum provides, try something new and go with a mint--it will give you the fresh breath, but without the harm to your teeth! Thick jerkies and nuts like almonds, hazelnuts, walnuts and macadamia nuts are not your friends when you have braces. Eating beef jerky can loosen the wires and brackets of your braces because it is so tough to eat. Same goes for eating most kinds of nuts. Nuts are very hard and small, two challenging things to eat with braces. If you are a nut lover, try getting your fix through a nut butter or spread. That way you can get the taste and nutrients from the nuts, but without doing damage to your brackets or wires! 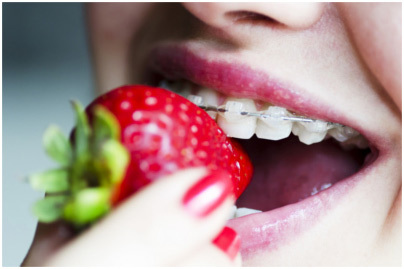 Although they’re high in nutritional value, eating raw fruits and vegetables can be complicated with braces. Biting into a crunchy apple is challenging enough without brackets and wires on your teeth. This isn’t to say you should cut out raw fruits and vegetables from your diet, but they are going to require a little extra preparation while you have braces. Try cutting fruits like apples and pears into small, bite-sized chunks for a grab and go snack. If you love eating carrots and corn on the cob, cut and cook the carrots and cut the corn kernels off the cob before eating. And if you think these extra steps are just too much, there is always the option to drink your fruits and veggies by using a juicer. Yes, just because you have braces doesn’t mean you get to skip out on eating your fruits and veggies! Call us at (541) 848-6642 to schedule an appointment. 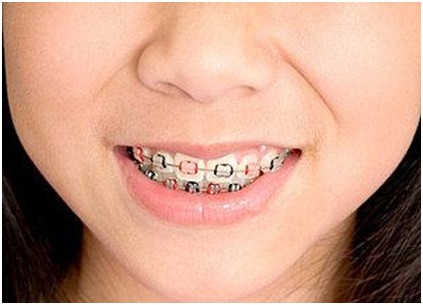 Many teens will have to spend at least a year or two of their lives with braces. And although you know that braces can straighten your teeth and give you a healthier smile for life, the lengthy process can make it seem impossible. Counting down your time with braces can help it pass more quickly and build excitement for when you finally get them removed. Take the typical calendar countdown a step further by designing your own. Use an online customization service to upload photos or designs for each month. After each day is done, write out a reason why you are getting your teeth straightened, or an event in the future when you will appreciate your straight teeth as you smile. It will all be worth it in the end! When you receive regular rewards for continuing to wear your braces, they can seem less burdensome. Treat yourself to a nice reward every month that you wear your braces for the duration of the treatment. The time will pass much faster when you feel you are earning rewards for your patience. More likely than not, you aren’t the only one in your circle of friends with braces. Why not share the experience? Create a Facebook group where you can post updates, calendar markers, pictures, status updates, and the things you look forward to eating once the braces are off. Create a board on Pinterest that will be devoted to planning your celebration of the braces removal! You can pin great ideas, recipes, activities, crafts, motivational quotes, and much more. After each check up with your orthodontist, smile and take a photo of yourself. That way, you can see the slow but steady improvements happening to your smile and track your progress. It will keep you motivated on the days you feel discouraged. Better yet, you’ll have something to look back on down the road and remember how your dedication payed off. Do you have ideas for your own braces countdown? Share them with us in the comments! And remember, having braces can be a challenging experience, but it’s also one of the most rewarding. We’re here to help you through the process every step of the way. Don’t hesitate to contact us at 541-848-6642. What’s the best way to floss with braces? ‘Tis the season for holiday cookies, candy canes, and hot chocolate--and for building up mountains of plaque on your teeth! Believe us when we say your trusty little box of dental floss will be your teeth’s best friend this holiday season. According to the American Dental Association (ADA), Floss removes food trapped between the teeth and removes the film of bacteria that forms there before it has a chance to harden into plaque. Toothbrush bristles alone cannot clean effectively between these tight spaces. Floss comes in a wide variety of brands, flavors, coatings, and colors, but in the end it does one main job: cleaning the areas in between your teeth. The easy answer to which kind of dental floss is best for you is whatever kind enables you to successfully and regularly clean those areas. The ADA recommends flossing at least once a day, and you should be prepared to spend about three times as long on your dental routine with braces than without. Flossing with braces can definitely be more challenging, but it is essential that you do so in order to maintain a healthy dental routine to get the most out of your orthodontic treatment. Use waxed floss or a product specifically designed to clean around your braces, as unwaxed floss can get caught and shred in your braces. Sliding the floss between the teeth above the wire is a bit like threading a needle. An orthodontic floss threader is an inexpensive and disposable tool available in nearly any store that sells toothbrushes and toothpaste. 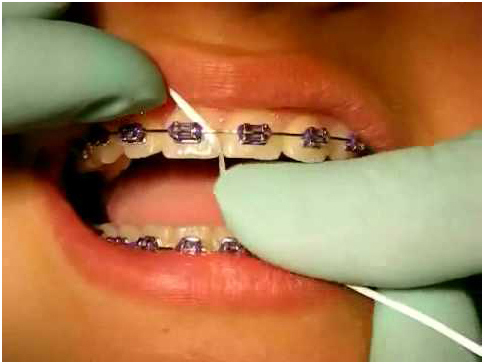 It is indispensable when flossing teeth with braces because it allows you to pull the floss through the teeth above the wire and reach the gum line. Don’t wait until New Years to make a habit of flossing daily your new resolution. Start fighting plaque buildup from all those holiday goodies today! And if you have more questions about proper flossing technique and which floss is best for you, don’t hesitate to give us a call at (541) 848-6642. Getting braces affects many aspects of daily life. When you come in for your consultation and subsequent visits, you’ll get information on how to take care of them, what to eat, how to keep your teeth clean, etc. But what about those obscure questions you never thought to ask, or were perhaps too embarassed to? We’ve got a few covered--but please don’t hesitate to ask us if you have more. Your dental health is our priority! Can I put charms on my braces? Unfortunately no. Charms belong on bracelets. If you bite down on the charm, you could damage your braces or your teeth. You could also swallow your jewelry. But that doesn’t mean you can’t have fun with your braces! Decorating your braces with colored bands is always an option. Is it OK to use my teeth as a bottle opener? While it may seem more convenient and relatively harmless, this is a BIG no. Never use your teeth as a bottle opener. This becomes even more important when you are wearing braces. While braces straighten your teeth, your teeth are moving in the process. That makes them weaker, and the metal in the braces does not make them invincible. Buying a bottle opener is much less expensive than having to replace your braces. Can I use my braces as a radio? Can I kiss someone while wearing braces? You can still kiss someone while wearing braces. In fact, even if both of you wear braces, the chances of them getting locked together are almost negligible. However, to avoid cutting your partner’s lips, kiss with caution. Again, if you have more questions, feel free to ask any of us at Struble Orthodontics. Or, leave your question in the comments! Which Halloween candy is safe to eat with braces? We all know Halloween means candy. And even though we sincerely want you to take the bull by the horns, live life to the fullest, carpe diem, all that good stuff, we also would really like to make your orthodontic treatment as quick, painless, and enjoyable as possible. That’s why we’ve put together a list of braces-friendly Halloween candy options for you to take advantage of. The good news is that you can still live it up in the candy department this October while keeping your teeth healthy and your orthodontist happy! Certain sweets can cause some serious damage to your teeth and braces, which can delay precious treatment time. 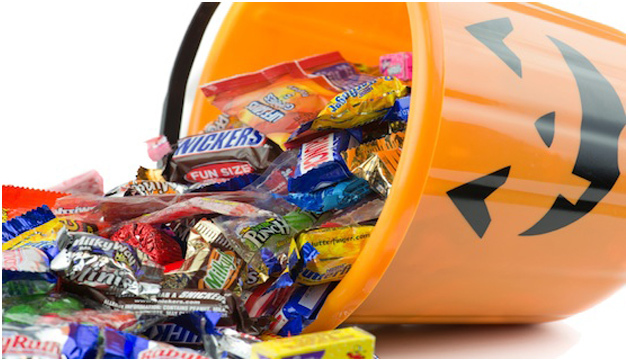 Hard candies, chewy candies, caramels, taffy, nutty goodies, jelly beans, licorice, bubble gum, suckers, Tootsie Rolls, and sour candies are some of the foods that can cause havoc for trick-or-treaters who are undergoing orthodontic treatment. Skittles and M&M’s may seem innocent, but those tiny pieces of candy love to slip inside wires and pop off brackets. Better stay away. Furthermore, sour and fruity candies like Starbursts and Skittles are the worst because they are highly acidic, which can wear down the enamel that protects your teeth, paving the way for tooth decay and cavities. Staying away from sticky and hard candies this Halloween is the name of the game. In addition to avoiding broken brackets and bent wires, we encourage you to brush and floss between teeth immediately after eating candy, including around brackets and at the gum line, as well as swishing water in your mouth--even “good” candy can cause cavities! If you happen to damage your braces, give us a call at 541-848-6642 and we can help get your teeth all straightened out again. And from everyone at Team Struble, we hope you have a fun and safe Halloween! Congratulations! You’re getting braces. It’s an important step in the process of giving you a healthier, more beautiful smile. But just like like anything you have to work for, there are sacrifices that must be made in order to make sure the process goes smoothly. So to make your life easier, we’ve put together a bucket list of things to do BEFORE you get your braces on. 1. Chew (sugarfree) gum. Blow lots of bubbles. 2. Hit the grocery and candy store. You’ll want to enjoy your favorite hard and chewy foods one last time (for a while): things like carrots, beef jerky, taffy, pizza crust, bagels, popcorn, hard candy, nuts, and seeds. 3. Run your tongue along your teeth--you won’t get to feel the smoothness of them for a while. In fact, when some patients get their braces off, they’re so not used to feeling their teeth that they say they feel “slimy”! 4. Stock up on braces-friendly foods sooner, rather than later. If you do your research on what you can eat and find some good recipes, it will make the transition easier. 5. Buy a nice soft toothbrush and pick out a pretty one: you’ll be spending a lot of time with it (about 2-5 minutes a few times a day) brushing your teeth with braces. Getting your braces on is an exciting time. But it will also take some adjustments, including giving up some of the things you love now. It won’t last forever, and in the end it will be worth it. So stick it out--we believe in you! Have something to add? Comment and let us know! We know that the transition to eating braces-friendly foods can be difficult; you can only eat so many mashed potatoes and bowls of apple sauce, right? Last May we wrote a post on breakfast ideas. We wanted to follow up with some healthy snack ideas for those of you who might be looking for more inspiration! Remember, it's always a good idea to chew carefully, use bite-sized pieces, and brush after you eat. Braces work by applying a constant controlled force on your teeth in order to properly move them. If at any time this force is disrupted, it can delay your orthodontic treatment time—mainly by broken brackets and wires. This most frequently happens when you eat hard, sticky, or crunchy foods. So in order to keep your orthodontic treatment on track, it’s important to stick to braces-friendly foods. There's even a cookbook devoted to brace-friendly recipes: The Braces Cookbook by Pamela Waterman, available on Amazon. It's a great resource for snack recipes, as well as healthy meals for brace-wearing individuals who want to avoid orthodontic issues. With a little creativity, planning, and the willingness to make some adjustments in your diet, it's easy (and tasty) to eat well while being a safety-conscious orthodontic patient. Got more questions about foods that are safe to eat? Give us call at 541-848-6642. And if you come up with any good recipes of your own, please comment and let us know! Getting braces isn’t easy. It will require some adjustments, not only to your teeth but to many aspects of your lifestyle. Mentally preparing for braces will help reduce anxiety before and during the initial stages of wearing braces. We’ve compiled a list of things to keep in mind in order to ease the process. 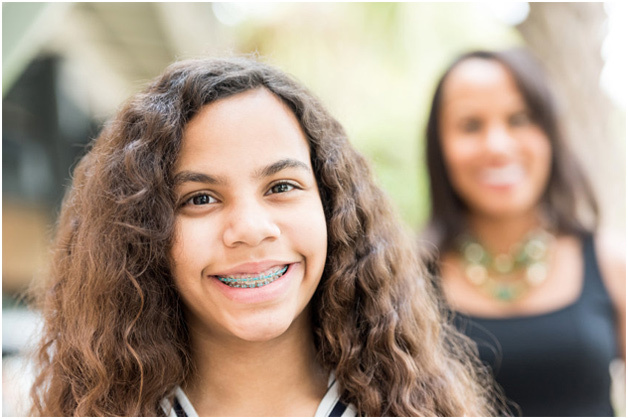 Whether you are going with traditional braces or new technology like Invisalign, braces are a commitment both for parents and for children. They will require time, energy, and money. 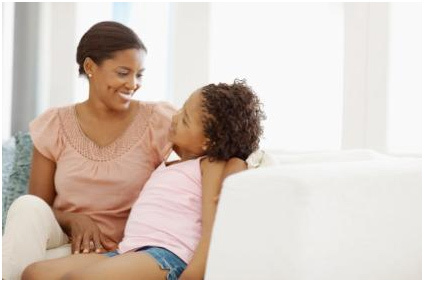 Help your child understand the commitment that is being made before you move forward. Talk him or her the hygiene commitments, the need to keep appointments, and how certain foods should be cut out of diets. Finally, be sure to sit down and discuss with your child that braces don't just magically take care of themselves. 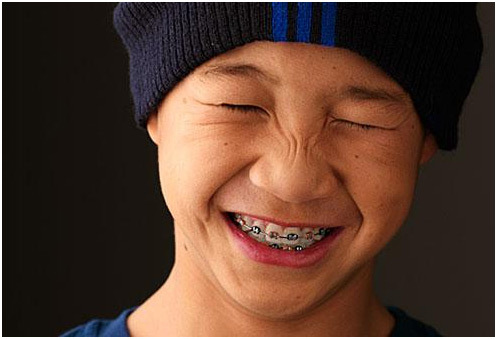 For many parents who had braces when they were kids, there was just one option: metal braces. Now there are all kinds of different options, including ceramic and Invisalign. There are also different treatments as well as payment plans to consider. Be sure to schedule a free consultation with us at (541) 848-6642 to see what will work best for you. The procedure can seem intimidating, especially if the child has heard stories about discomfort or pain from braces in the past. Parents should take time to explain why the orthodontist is taking so many pictures, x-rays and impressions of the teeth. That way, parents are removing the mystery of the procedure and allowing children to feel relaxed as the initial steps are taken to prepare for the braces. An orthodontist is trained to deal with the concerns of their patients. By allowing the orthodontist to answer questions and give explanations, a child will feel more comfortable during the process. The orthodontist can explain the elements of the process that parents might not fully understand or know how to explain in child-appropriate terminology. Hygiene is a challenge at the beginning, so parents should prepare children for the differences between normal tooth care and working around the braces to properly clean and floss the teeth. By dealing with the concerns, questions and complications before getting the braced put on, children will know the basics and can get started without problems later. Read up on our last blog for more on how to keep your teeth clean with braces. 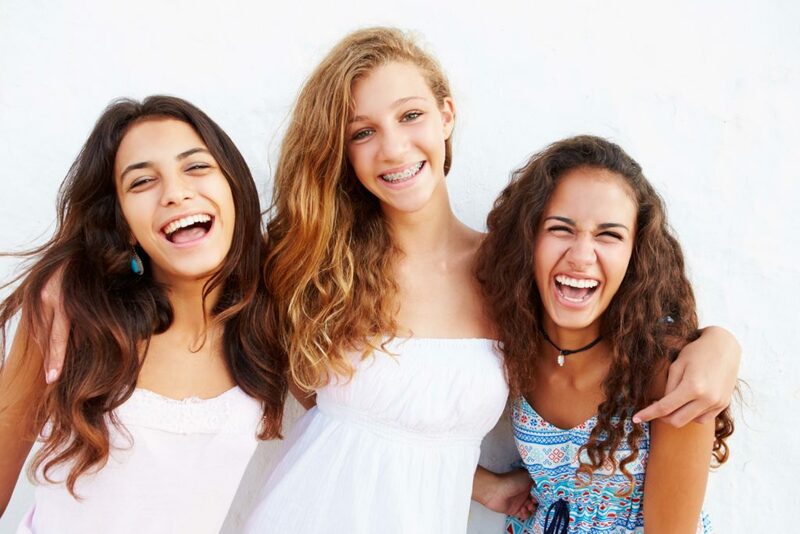 Getting braces might be seen as a rite of passage, but some children become worried about the reaction of friends, classmates and other individuals related to social activities. Parents should discuss the social concerns with children and explain the purpose of braces to help with potential self-esteem issues. 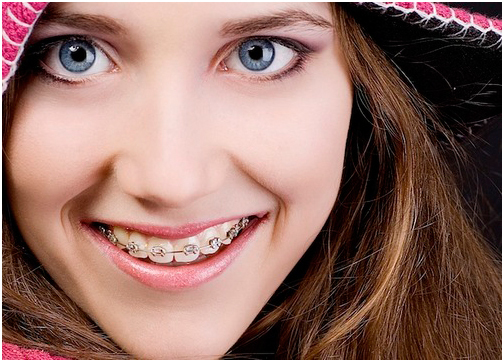 Braces are not always viewed as a positive when a child feels self-conscious about changing appearances. Your children will need help with their braces. They will need help flossing, tightening things, even brushing and dealing with pokey wires and brackets that rub on sensitive gums. Prepare yourself to be okay with the "hands on." And let your kids know that you will always be there to help. Preparing a child for braces is not always easy, but it can reduce feelings of anxiety or worry associated with the procedure. The more parents work on preparation, the better a child will feel during and after the process is completed. Above all, remember that it will all be worth it once we reveal your beautiful new smile at the end! What foods can I eat with braces this Thanksgiving? First off, we’d like to wish everyone a happy Thanksgiving! We are so thankful for our family, friends, coworkers, and patients--and the delicious food we’re about to consume. 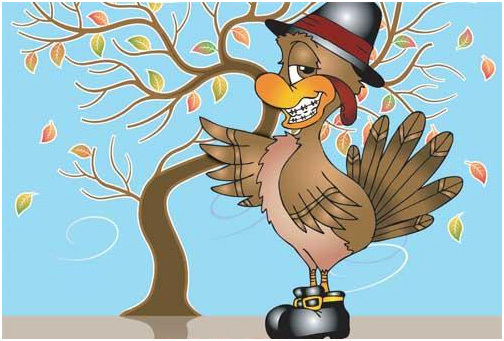 And you can be thankful that you don’t have to hold back this year because of your braces! Most Thanksgiving staples are ok to eat, but there are a few that you should avoid. Turkey and Ham – you can actually eat the mainstay foods of the holiday! Just cut the meat into smaller, more manageable pieces and avoid eating it off the bone. We hope this will help you get through the holiday without any orthodontic emergencies, while still enjoying the food you look forward to eating all year! If you have any questions, don’t hesitate to give us a call at (541) 848-6642. Have a wonderful Thanksgiving! Take a look in the mirror at your new braces. The brackets and wires have nooks and crannies that can trap food and plaque. This means your risk of tooth decay and gum problems may be higher while you are wearing braces. Putting some extra attention into your teeth and gums will prevent tooth decay and staining, so you’ll have the smile you always dreamed of once your braces are off. A regular toothbrush just doesn’t cut it when you are wearing braces. Using an interdental toothbrush will allow you to effectively clean behind your braces. This type of brush has bristles that are shaped like a Christmas tree that can get in there and remove food residue in the braces and on the teeth. We also recommend using a WaterPik, which uses highly pressurized pulsating water to help get all of those hard-to-reach places. 1) Gently brush along the gum line where the gums and teeth meet, using a small circular motion on each tooth. 2) Spend about 10 seconds on each tooth before moving onto the next tooth, brushing in a set pattern so that you don't miss any teeth. 3) Gently brush the braces. Press your toothbrush firmly enough so that the bristles spread into the gaps between the wire and the tooth. Brush in and around all of the brackets and wires. Braces block food from naturally escaping your teeth after eating, so it’s important that you take the time to brush and floss after every meal. The less time food has to sit on your teeth, the less likely it is to cause decay. This may seem like an inconvenience, but trust us, when you get your braces off it will all be worth it. Even after properly brushing and flossing, there are probably some food particles in your braces. A fluoride mouth rinse is the best way to ensure that every bit of food is removed after meals. If you don’t have mouth rinse available, just use water--it’s better than nothing! Prevention is definitely the best medicine when it comes to avoiding tooth decay. If you can nix decay-causing sugary foods from the outset, you’ll spend less time trying to treat problems in the future. Acidic foods and drinks can also damage tooth enamel when consumed frequently or when sipped over extended periods of time. Soda is especially hard on teeth because it not only contains acidic flavor additives, but it also includes 10–12 teaspoons of sugar, which further increases your chance of developing cavities. Visit your dentist regularly while you are wearing braces--typically every 3-6 months--to ensure that little problems don’t turn into big ones. Your braces are working hard to straighten your teeth, but they do make it a little more difficult to keep your mouth clean. Making these simple alterations to your daily routine can ensure that you get the best results possible. Give us a call with any questions or concerns you may have: (541) 848-6642. Braces aren’t easy for your child to deal with. But if you make the most of your child’s braces, and they’ll be rewarded with a show-stopping grin! And we’ll be there every step of the way. Parents can’t always tell when kids need dental work. Even if their teeth look straight, they can be crowded and bites can be off—causing issues in the future. Your dentist can recommend a good orthodontist. And the best part is, we provide free consultations. Now orthodontia for kids happens in phases. For example, they might start with a retainer in 5th grade so permanent teeth actually grow in straighter, or they might need braces twice. Being prepared can only help! The cost of your orthodontic treatment will vary depending on your child’s individual needs and treatment plan. We will work with you to create a payment plan that fits your budget, and assist you with what to expect before beginning treatment. Our practice accepts most major credit cards and insurance plans. Kids in braces are self-conscious. Let them know they’re not alone. Show them your old photos and laugh at yourself. Tell them they look gorgeous and keep them smiling big. It's just like taking your kids for shots when they were babies—Tylenol or ibuprofen BEFORE the appointment. Be aware that their jaw might be sore and that headaches might last for a day or two. 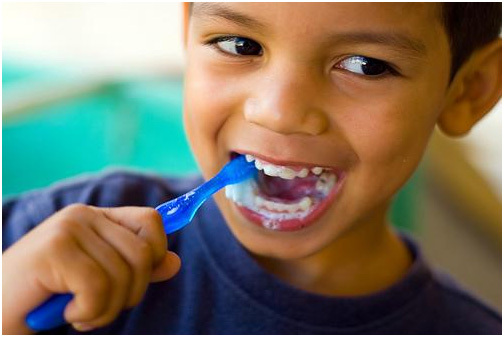 Remind your child to brush 2 times daily or after eating. Use a soft-bristled brush for the tops and bottoms of brackets and a proxabrush for in- between braces. It is also important to floss 1-2 times daily. Thread under archwire and between teeth. Use a floss threader if needed. Especially when playing sports. You can buy generic or ask for a custom fit mouthguard to prevent injuries and protect your child’s expensive appliance. The price and commitment of braces is worth the investmentit in order to steer clear of physical issues and self-consciousness later in life. Your child might not thank you now, but they’ll certainly appreciate it later! We want your child’s experience with braces to be as seamless as possible. Call us at 541-848-6642 for more tips or schedule a complimentary consultation with us!